In this article we will cover only a small selection of possibilities this program gives you and we will explain how to improve project management and work efficiency while working on tasks in Microsoft Outlook. Let’s start with building the right Outlook folder tree structure. As you can see in the picture above CodeTwo Public Folders lets you create public folders in the exact same way as it is done with private items. 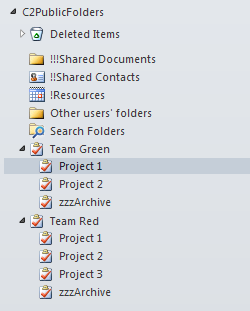 Every folder appearing in the C2Public Folders section is by default visible to all users in the network. If the access rights are not changed by the administrator, users can read, modify and delete public folders whenever they want. What’s more all changes are synchronized with other machines in real time. In this example we have split the whole office into two teams: Team Green and Team Red. Every team has its tasks grouped in projects and assigned to team members. The advantage of this method is that every project can be divided into smaller stages (tasks). This organizes teamwork in a better way and results in good job performance and quality. Thanks to CodeTwo Public Folders team members and managers can monitor the progress of the given project, since all changes are replicated to other machines in real time. Team members only need to update the status of a given assignment and keep a log of everything what’s completed within the task (as shown below). 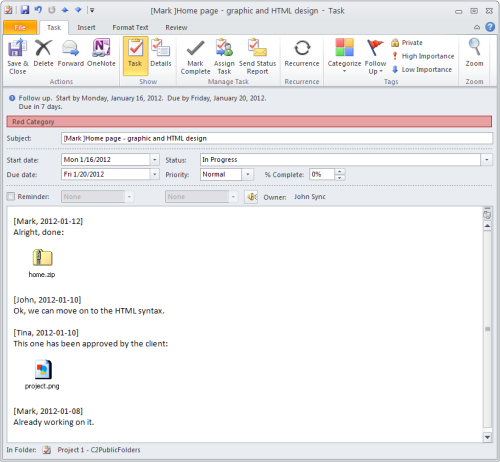 Note that all data is synchronized together with the task, including documents and other files attached by users. If you want to test these settings live, feel free to evaluate the program at no cost. 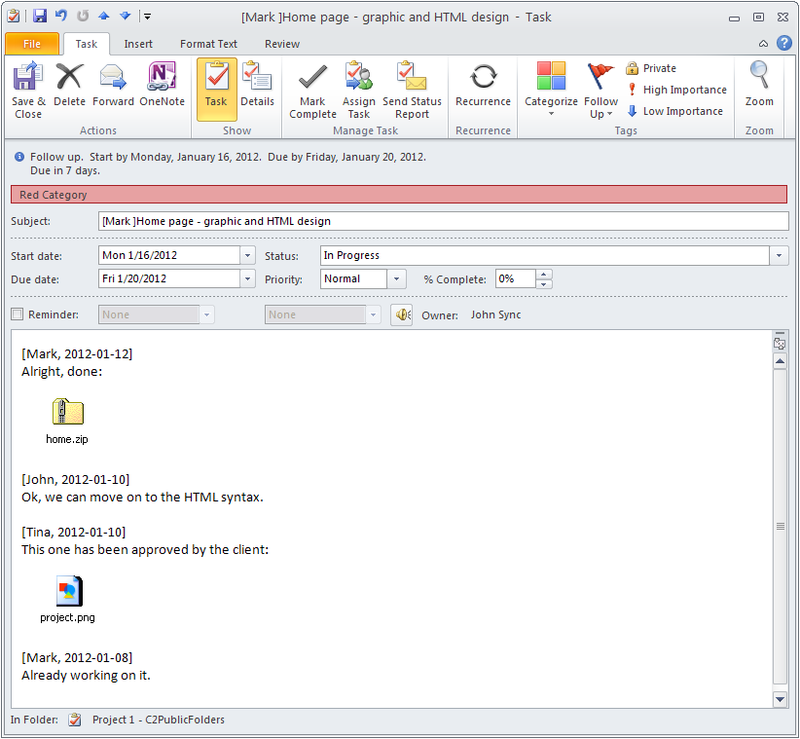 The 30-day fully functional trial version of CodeTwo Public Folders is available at www.codetwo.com.